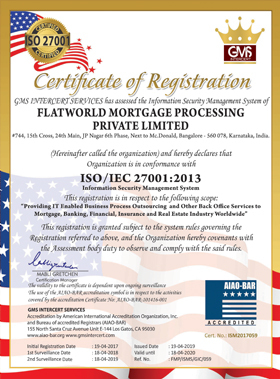 Getsmartcoders is now a part of data secured organization as our parent company, Flatworld Solutions is an ISO 9001:- 2015 certificate holder. Our ISO certification stands as a testament to our great service quality. We use well established QA standards in all of enterprise services to ensure client satisfaction is always at the highest level. Committed that we are to delivering high quality services, we have embarked on a never-ending search for continuously improving our processes and managing them with industry best practices. It is precisely because of this steadfast commitment that we have always been consistent in delivering services beyond the expectations of our clients. The ISO/IEC 27001:- 2013 ISMS Certification is accredited to those institutions that help you maintain high security risks. As a certified company, we have put in place the right controls, to provide robust and fool-proof security to manage internal information requirements of our clients. Aside from this, we have complete backup policies to protect loss of customer data and client intellectual property at all times. Further, we use industry best practices and contemporary technology to safeguard vital client business data. Our ISMS certification has given our clients the confidence they need to entrust us with their business data. If you wish to know about our security standards and infrastructure, get in touch with us now.